Appley is a free Bootstrap HTML5 app landing page template. It comes with latest and dynamic features like Hero header, sticky top navigation bar, pricing table, parallax effect, app screen carousel, and modal youtube video player. 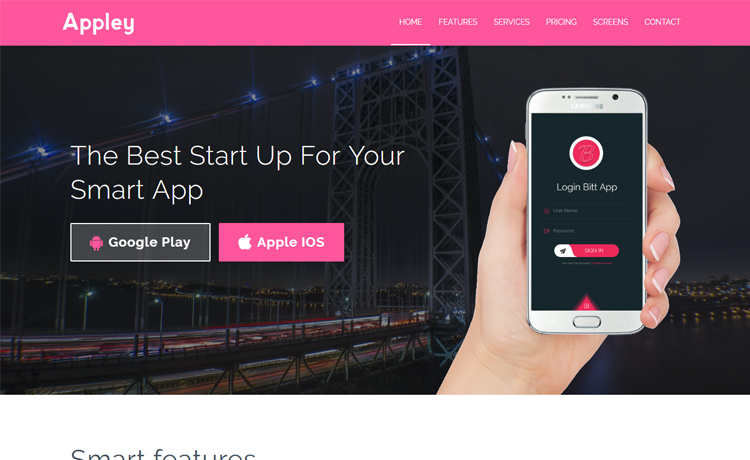 Appley is a free Bootstrap HTML5 app landing page template. This responsive landing page template perfectly matches agencies, business, mobile app, web app, startups, and marketing websites. Moreover, It is a clean and minimal theme with a single page layout. Appley is cross-browser compatible. Thank you for downloading Appley. Here are three recommended free Bootstrap HTML5 app landing page templates.